An iOS 10/11/12 device comes in use when we have plenty of good apps installed. Your device can lag a bit in a row, and why would it do that? It’s just because of the huge space used by the iOS 10/11/12 apps. You might want to free up some iOS space so you can add your favorable contents. Apps can be easily downloaded, installed and uninstalled in any device on iOS. But you might want to choose the most convenient and easy method to remove your iOS apps. (1) You can remove apps from iOS 10 straight from your device in the home screen. Long press the icon of the specific app you want to delete. The apps will start jiggling and a little cross shaped dialog will appear on all apps. Press the cross and you will have the iOS 10.3 app removed. (2) Or you can delete iOS 10.3 apps directly from the Settings. All the installed apps will be listed there, just click on one app and select Delete App. Step 1: Connect your iOS 10.3 device to the computer where you already have iTunes installed. Step 2: Launch iTunes. Click on the device icon when iTunes detects your device. Click on “Apps” from the left sidebar. Step 3: All the "Home Screens" will be shown there. Double click on the specific home screen where the apps you want to delete locates. Step 4: Click on the app you want to delete and then click on the "x" icon at the top left corner. Step 5: Click on "Apply" at the bottom. Then the app will be removed from iOS 10.3 device. 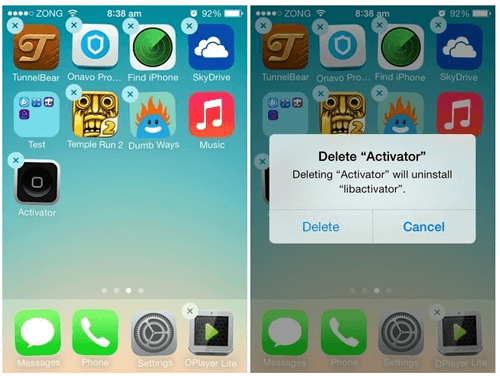 If you expect a more convenient and efficient method to delete iOS apps, here is the best choice for you. As one of the best iOS cleaners, iMyFone iOS Cleaner or iMyFone iOS Cleaner for Mac certainly provides the facility of uninstalling those unwanted iOS apps selectively in bulk. Clean Hidden Junk Files for FREE- Totally clear all app cache, crash logs, cookies, corrupted files, temp files from iOS to save space and boost up iOS. 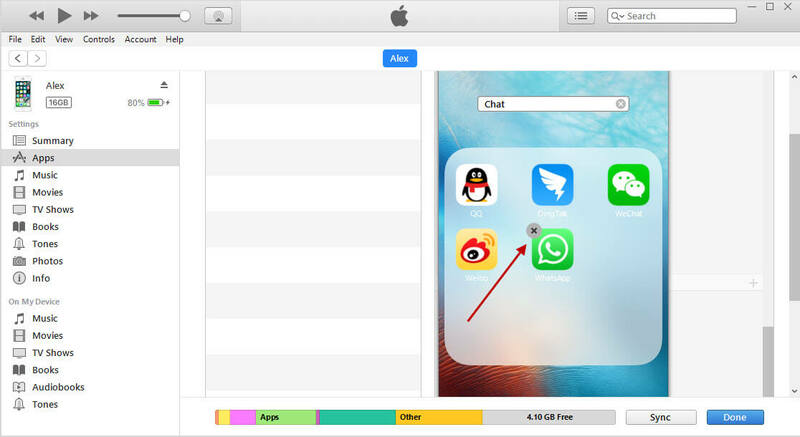 100% Unrecoverable Erasure - Permanently delete messages, contacts, photos & videos, history, notes, WhatsApp chats etc. Wipe iOS History - Previously deleted files can be found out and permanently erased from iOS. 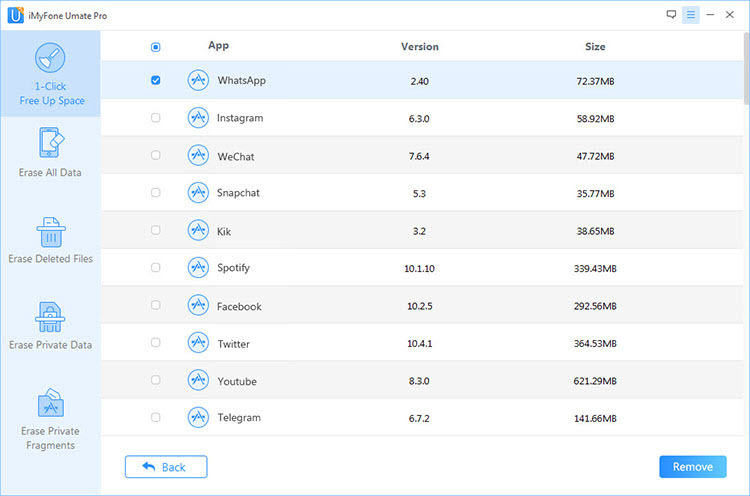 Erase Third-party Apps - Incomplete fragments of third-party apps can be completely destroyed to protect privacy. "I was really impressed with iMyFone iOS Cleaner. Space-saving apps are a famously scammy category. It’s great to see one that over delivered on its promises. It managed to. save me over 15 GB of space. -- Dave LeClair from MakeUseOf"
Step 1: Just connect your iPhone/iPad with the computer in which iMyFone iOS Cleaner is installed. Step 2: Launch the software and click on "Quick Scan" button to let it analyze your iPhone. When it finishes, it will show you how much space can be cleaned on your device. Step 3: Click "Clean" beside Apps and it will list all the apps on your iDevice. Check the unwanted apps and hit Remove to start the deleting process. The apps and app data included will be removed from your device. 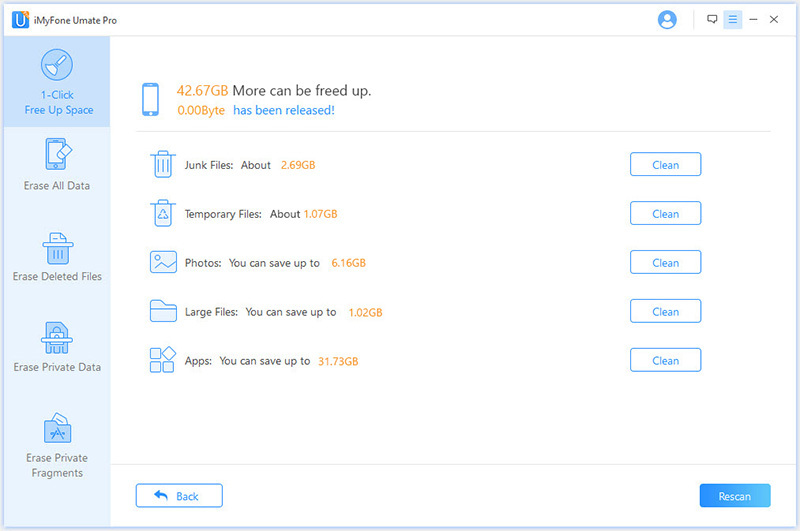 If you want to manage your music/video/photo library on your iOS 10.3 or iOS 12, you can also try iPhone Media Manager, which can freely transfer iPhone files between iPhone and iTunes/PC, as well as delete and export iPhone files.